Another day out with Happy Meal--this time the California Science Center. A bigger hit than LACMA. 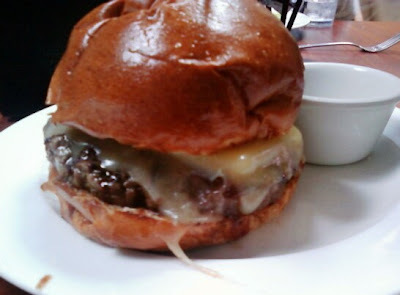 After 4 hours, we were hungry, and we made the journey to a newish spot, Burger Kitchen, to bust some cheeseburgers. Walking up, we were greeted with the sight of one of the servers dumping beverages from a vacated table at the base of one of the trees that lines the street. Straw and all were poured out, and there was a nice collection of straws, so this appeared to be common practice....gross. Service was scattered and disorganized, especially considering that we were the 6th table, and there were three front-of-house staffers. Burger Kitchen announced the fact that they have Pat LaFrieda beef at every opportunity--menu boards, menus, website, etc., but we did not discover that they were out until AFTER we attempted to order it. WEAK. Note: Don't make people wait 10 minutes to discover the fact that the ONE thing that is your claim to greatness is not available. The single portion of fries was massive--too much for an adult and a child, but the waitress did not bother to mention that when I ordered two with our burgers. I took home about two pounds of fries. We were never asked if we wanted a beverage other than water. Our water glasses went dry with no offer of a refill. They placed WET skewers in the burgers to keep them assembled during the trip from the kitchen. They claim that this was to avoid splinters, but plucking a clammy stick from a burger...c'mon--they were cold and wet, and that couldn't have been up to health code. A wet stick in rare beef........blech. The plates and tables--not properly cleaned. Sticky residue on the table, and crusty stuff on the bottom of the plate was encountered when shifting the plate. The ketchup that came with the fries was way too spicy to serve to a child. I had to ask for suitable ketchup. The dessert that I ordered for Happy Meal did not arrive as described....they took it off of the bill, but a chocolate ice cream sandwich is wildly unlike a pile of vanilla ice cream on a single cookie with chocolate syrup. They were out of cookies, and chocolate ice cream, and communication skills. I had to get up and track down a spoon, since a fork is not an effective way to consume what was intended to be an ice cream sandwich. Finally, the waitress only bothered to check in with us only as I was chewing the last bite of burger... Comedy. When I did mention to the manger/owner? of the joint that the tomatoes were mealy and clearly unripe, he was surprised and immediately suggested that I could have have them replaced. I suggested that they simply not have been served in the first place. OK, you get the point--the service was disorganized. How about that burger? Funny thing...This burger flirted with excellence in spite of the fumbling staff and some quality control/back-of-house issues. The rib, chuck, and sirloin blend was coarsely ground and perfectly prepared. Sadly, it was peppered with connective tissue, and was a little too greasy. Easily remedied, and the flavor was there. The brioche, had it not been a little stale, would have been just fine, and it was toasted properly. The tomatoes were mealy--not a big deal, they were window dressing but still........it was shite form. The patty was griddled to perfect sear, and it was impeccably seasoned. The Sommersetshire Cheddar provided a splendid, creamy, sharp, and salty counterpoint to the aged blend. It really made the burger. The Meat : Bun ratio was damn close to perfect. The portion of beef was relatively huge. The Golden State could take a page out of this book. Given a year to settle in and work out the service and quality kinks, Burger Kitchen this may evolve into a top-notch burger establishment. I mean, it better, since burgers constituted 90% of the menu items. I do not plan to spend money/time there again until the nonsense gets resolved in terms of service. Burger Review : Excellent in terms of flavor, but one needs great patience to look past the blemishes . If they are able to grow past some serious service issues and a couple of quality kinks, Burger Kitchen may be worthy of a second review. Rating...4 Bites really 3 1/2 Bites, because of the staleness of the bun and the connective tissue in the beef. The skewers are now dry. The have organized the dining area into sections, and they now assign servers to those sections. They have created a better ordering plan to insure that ingredients are on hand. They have a new inventory and portion control system. 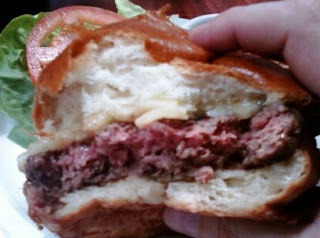 I will re-review, since the burger fundamentals of sear, seasoning, grind, blend, etc. were all in place.